When the stories that lead our daily news involve momentous constitutional questions, present-minded journalists and busy citizens cannot always see the stakes clearly. In The Constitution Today, Akhil Reed Amar, America's preeminent constitutional scholar, considers the biggest and most bitterly contested debates of the last two decades-from gun control to gay marriage, affirmative action to criminal procedure, presidential dynasties to Congressional dysfunction, Bill Clinton's impeachment to Obamacare. He shows how the Constitution's text, history, and structure are a crucial repository of collective wisdom, providing specific rules and grand themes relevant to every organ of the American body politic. 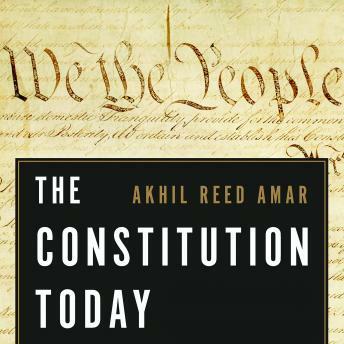 Leading listeners through the particular constitutional questions at stake in each episode while outlining his abiding views regarding the Constitution's letter, its spirit, and the direction constitutional law must go, Amar offers an essential guide for anyone seeking to understand America's Constitution and its relevance today.